Winter came early this year in the Okanagan. As I write this, it’s cold and the snow is falling. There is lots of snow up in the mountains and our local ski hills will soon be filled with people strapping on skis, snowboards and snowshoes. As the snow falls, breweries are getting ready to launch their big, rich winter ales, perfect for the cold days ahead. You’ll see lots of stouts, porters and other delicious winter beers out of the South Okanagan this year. Cannery Brewing’s Maple Stout is back for the winter. It has a new look and a new name, Heist Maple Stout, giving a nod to the great Maple Syrup Heist in Quebec in 2012. The Kindling Breakfast Stout, made with Red Beard Coffee from Kamloops, chocolate and oats will also be back in time for Christmas. Tin Whistle Brewing recently launched a new hazelnut espresso stout called Extortionist. They are also bringing back their Chocolate Cherry Porter in early December. This winter favourite is a delicious dark ale made with fresh cherries and cacao. Over at Bad Tattoo Brewing, they recently released the 4th vintage of Cerveza Fuerte, a Belgian Quad limited release beer. At the same time, they also released La Resurreccion, a brandy barrel-aged version of the 3rd vintage of Cerveza Fuerte, They also recently released a new Porter, born to father Robert Theroux, head brewer. This Porter was born on November 4th and goes by the full name of Porter Young Theroux. Porter will surely be best friends with owner Lee Agur’s baby girl Kiana, who was born on September 12th. The Barley Mill Nitemare Brown Ale, with flavours of chocolate and caramel malt has a roasty finish, perfect for the season. Meanwhile, down in Oliver, Firehall Brewery is bringing back their popular Stop, Hop & Roll Oatmeal IPA this winter. They are also releasing a new vintage of their website with up-to-date info on holiday events and new Beer Department swag available for online Christmas shopping. And speaking of Christmas shopping, if you’re looking for beer or beer swag for the craft beer lover on your shopping list, maybe a trip to the South Okanagan is in order. There’s lots of sweet new beer swag, growlers and Christmas gift packs to be found at our local breweries. You can visit the breweries and go shopping at the same time. It’s a win/win. In all seriousness, if you are thinking of a winter Okanagan getaway, the Penticton Ramada has a special Penticton Ale Trail accommodation package on until the end of the year. The Penticton Ale Trail package includes two nights at the Penticton Ramada for two adults, two bottles of Bad Tattoo beer in your room and a $40 gift certificate that can be used at either Bad Tattoo Brewing or the Kettle Valley Station Pub. With five craft breweries within a few minutes of each other, you can easily visit all of the breweries on the Penticton Ale Trail. You can also head north to Summerland to visit Detonate Brewing and head south to Oliver to visit Firehall Brewery. If you like craft beer and hitting the slopes, come join us for Brewski, a craft beer, spirits and cider festival coming up at Apex on February 17th. It’s hard to believe, but this year marks the 5th annual celebration. 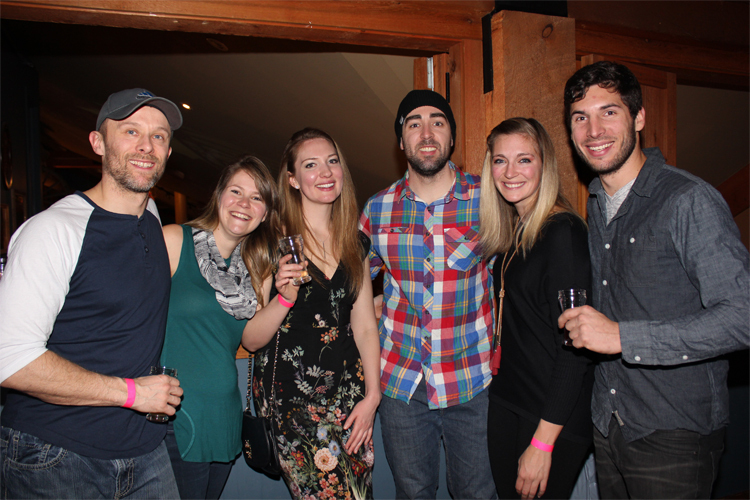 This event, held at The Gunbarrel Saloon at Apex Mountain Resort, has become a signature event at the hill. Last year it sold out in record time, so watch for tickets to go on sale in December via Eventbrite. Your Brewski ticket also gives you a discount on lift passes, so plan to spend the weekend on the hill. Hit the slopes during the day and then celebrate the Apex aprèsski vibe at night. Ask about Brewski accommodation rates when you book your weekend stay. Another great reason to plan a trip to the Okanagan is for the 23rd annual Okanagan Fest of Ale coming up on April 13th and 14th in Penticton. Early bird tickets are on sale now until January 15th. Also check out the Sip & Stay ticket and accommodation getaway packages. Join us at the fest for great craft beer and cider, live entertainment and delicious food. If you haven’t been to visit lately, come see for yourself why Penticton was recently named as one of Canada’s best beer towns, by Expedia.ca. We offer a fabulous four-season playground where any time of the year, you can play by day and sip on craft beers by night. Until next time, cheers.